I want to acknowledge you and the other participants in last weekend’s Workshop and thank you all for your dedication and openness. I was apprehensive prior to the Workshop about how much I was going to have to share my feelings, as this is something that is very hard for me. All the participants were supportive and without judgment of any kind. It allowed me to freely express my feelings and fully experience the moment. I head back to my tribe with clarity and renewed commitment to my tribe members and my self. I thank you for the opportunity and a life changing experience. I look forward to the next Workshop. This is on your website. of educational technology to facilitate personal growth." I don't think I can say it any better. traveled from great distances ... because I got to meet them. Austria, Germany, Australia, Hong Kong, India, Canada, England ... awesome. Thank you for allowing me the opportunity to experience The Trading Tribe. I commit to TTP and apply for membership in the Incline Village Tribe. I regularly attend the meetings and the research group. I commit to conduct and publish original research, participate fully as a receiver, and take the hot seat and/or manage a process at every meeting. OK. You are welcome to attend. Our next meeting is on May 26. A number of IV Tribe members are leaving to run their own Tribes in various cities, so there is room for some new members in Incline Village. Reading FAQ, I know the workshop is magic. At the workshop, I learn something about the essence of magic. Working together, as a tribe, our positive intentions produce results that cannot be explained by standard Newtonian thinking. The concepts of willingness and commitment crystallize for us. The power generated by a group of supportive individuals deeply affects us. I understand that we get what we want by our intentions. We concentrate in the present moment of NOW to clearly define our intentions. We are willing to feel the feelings which come between us and our goals. We commit to feeling those feelings, and to receiving support from tribe members who contract with us to assure we achieve our goals. Folks at the meeting, mostly strangers to each other, amaze me with their willingness to commit to TTP and to their fellow tribe members. Everyone, even those initially skeptical, has a rewarding experience. I am in awe of the depth of the feelings expressed during this gathering. I commit to the work of TTP. Thank you for the amazing weekend and for sharing TTP with us. I consider it a privilege spending time with you and the members of the Incline Village Tribe. You are accomplishing something truly remarkable: you get a group of people together, many of them having never met before, and teach them how to direct all their energy towards helping each other become better traders and better human beings, accepting each other completely. I am committed to my snapshot and to continue practicing TTP. What a workshop! Each time we go further in the first day than the entire previous workshop. I feel tremendous happiness and reward for having the opportunity to share the TTP with others. At this workshop I see people that have never experienced TTP bring up and dissolve issues that are with them for years and even decades. One person that is extremely skeptical coming in experiences his feelings of skepticism within the healing field of acknowledgement and reports a very powerful and healing experience. Another person that has a lot of unresolved grief from a severe life trauma experiences his resistance to feeling the grief and reports the release of a constant tension that is with him for years. The "price" these folks pay for these benefits is about one day of work on conscious mind understanding of the process and about 1 hour on the hot seat honoring Fred by experiencing the feelings. This seems like a great trade to me. I am constantly amazed at how effectively clear intention and willing receivers disappear the illusion of time. These people and others at the workshop might spend years in traditional therapy or in the DIM process and still not achieve the benefits from 1 hour on the hot seat. Thank you for your commitment to bring this work to more people by writing your book and holding these workshops. It really is changing lives! I'm wondering if replacing my current trading system with a another more desirable one is a good idea. Committing to one system or evolving and replacing it with a better one. That might depend on who is doing the desiring. You might try writing your thoughts in SVO-p to clarify your meaning. Your second sentence has no subject. You might consider taking your tendency to leave yourself out of your own plans to your Tribe as an entry point. the subjects of our sentences. About 30 male traders and 1 female non-trader have a lot in common, maybe everything except gender and profession. I attend the TTP Workshop in Reno and I experience an immeasurable positive shift in both my thinking and feeling. Although I do not follow a trading system, I follow a “life system.” I learn that a trader feels fears, indecisiveness, stress, and inconsistent confidence to stick to his system or identify that it’s not working and change it to something he can follow. I relate strongly with this because I see I am haphazardly following a life system that is not working for me and I feel stuck, forgetting, if I ever knew, that I can change my system to one that I can enthusiastically embrace. During the workshop, I find feelings in common with every person there -- almost all men, from diverse backgrounds, different geographic locations, varying interests. I want to describe my experience to people who were not at the workshop, and I think TTP can only be described by experiencing it. I receive feedback that there is something different about me, that I even look different. I realize the impact of the workshop is radiating from me and speaks for itself. This is an exacting participatory process. I recommend it to anyone who wants to remove barriers to thinking clearly, feeling deeply, connecting with others, and achieving professional or personal dreams and goals. I recommend this to women and non-traders and people who have jobs or friends or love relationships. I commit to writing FAQ again by June 30. Thank you very much for a fantastic weekend of learning and development. You are every bit the great man I read about and much more. I am reflecting on the weekend with my wife while we watch the snow fall over your wonderful Lake Tahoe. I very much hope to see you in [city] at some stage. Thank you again for putting on a fantastic workshop this weekend. My mind is popping with images of my experience. In my haste to meet my plane, I neglected to ask you for a copy of your book. I want that very much. I will forward a testimonial regarding my experiences on the weekend when I assimilate everything that happened to me. Thank you for providing the opportunity for me to have such an extraordinary experience! I acknowledge you for not only having this vision but sharing it with others. I am quiet and reflective today, feeling deeply powerfully me and wallowing in myself. I thought up a couple of new verses to the "Trend Following Song" this morning. They concern risk management. Here they go! when it's time to trade, honey? when it's time to trade, babe? when it's time to trade? when a trade goes wrong, honey? when that trade goes bad, babe? when a trade goes wrong? Now if we can just find someone to perform it. I'll be bark in arf an hour. I plan to start a San Francisco tribe. I want your support in making this happen. I look forward to your guidance. Thank you. I thank you ... and the IV tribe for an amazing weekend of education, friendship, self growth and awareness. I intend to write more for the FAQ. It is truly amazing to reflect on all that happens at the workshop this weekend. I feel it is a life changing experience for me. I hear this from others as well. I am tired and jazzed at the same moment. A heartfelt thanks to you for your leadership and for your commitment in sharing the technology of TTP. I want to also acknowledge all the other presenters for the role they play in making this workshop so successful and unforgettable. All the participants really make this weekend special by the intensity of their commitment to share their feelings and their willingness to support others. It is a truly International gathering and noting this leads me to I believe there really is hope for the coming together of the world community with people sharing feelings through TTP. I read your book some this afternoon -- wow --- it is awesome. Each chapter brings me more to learn and practice. I want to start a Trading Tribe in Porto Alegre - Brazil. Thanks for the support in the TT Workshop last weekend in Reno. 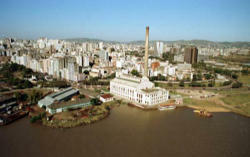 Attached a Picture of Porto Alegre. Fred and The Fred-ian Model: The mind comprises Conscious Mind (logic and reason) and Fred (*everything else*, including the sub-conscious, the limbic system, the autonomic system). I note very little detail concerning the description and cartography of Fred's internals, whose contents in TTP terms are said to include 'everything else' outside of Conscious Mind. I note that you are an engineer who is generally very, very precise. Will you please share some of your theories about Fred's internal operations between the everything-else components? 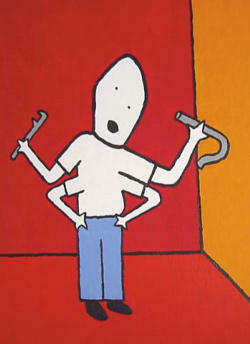 Fred is a science-fiction model of the mind. Fred is intentionally and precisely vague and ambiguous. You might take your desire to get a clear explanation of your feelings to your Tribe as an entry point. with two walls and a darker floor. Was just looking at the TT directory and wanted to give you an update. We are three members and meeting every two weeks. I am feeling very excited about seeing everyone this weekend. I am 42 yrs old and recently retired from the sale of my last business. I began trading last year and reading, studying, attending workshops, trying out multiple mechanical systems, etc. and have attempted to ‘day trade’ in futures, only to lose about a half million in a couple of months. I have determined that my personality and day trading do not go hand in hand simply because I like to be in control and I let my emotions get too involved. I’m sure you have heard and seen it all a thousand times over. Will your techniques and methods work with my personality type or should I just get out of trading all together? I am a hard worker and willing to study 12 hours a day, however, I have learned to admit my weaknesses and focus on my strengths. Am I wasting my time? High Frequency systems such as day trading tend to succumb to transaction costs, regardless of the personality of the trader. You might take your desire to be in control to your Tribe as an entry point. I would like to startup and be the leader of the San Diego area Trading Tribe. The first meeting will take place the end of next month. Per the Tribe website: "If you don't see a Community close by, you can start one. Send your full name, city, email and telephone number to this site. Your thoughts are very interesting. Attached are some thoughts I have re: airfoil design. It has been ages since I studied physics. However, your thoughts on air flow are very interesting. I have always been uncomfortable with the text book explanations given. My thoughts lie in changing the problem in a relative sense, assume that the air is stationary and the wing is moving. Get rid of the air flow concept. one another for a net zero lift. As the wing passes through this plane, the lower surface of the wing is relatively horizontal and flat so the increased pressure remains or slowly dissipates. At the same time the upper surface, by design, tapers down creating a partial vacuum and thus you have a net upward lift. At the trailing edge of the wing, the two air masses come together - the upper partial vacuum and the lower elevated pressure. Thus there should be some turbulence. Now when airfoils are tested in a wind tunnel with the wing held stationary - ??? You might consider becoming an air molecule for a while and noticing what you feel and do when you encounter an event like a wing. Air Molecules are Like People. to the forces they encounter. Air molecules are also unlike people. If you know how to code systems, life can be fun, but if you have to learn programming ... jeeze! I simply hate to sit down, learn pointers, data structures, code down seemingly simple examples and just bore myself to oblivion. I am too impatient to learn this c---, I keep wondering about something different, can't concentrate - rather complain to FAQ. The effort of learning programming is so huge that I often feel I should be doing something else rather than wasting my time and energy on this. This is frustrating! Peace of mind for God's sake!! You might take your feeling of impatience to your Tribe as an entry point.